Effectively reduce biting insects from your outdoor and indoor living spaces without propane, repellants or toxins! 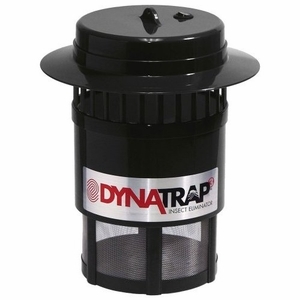 The all-weather DynaTrap features patented three-way insect control to provide up to 1/2 acre coverage of relief from mosquitoes, biting flies, Asian beetles, wasps and other irritating flying insects. Instead of propane or chemical repellents, two UV bulbs and CO2 lure insects to the trap. The TiO2- titanium dioxide exclusive coated funnel produces CO2 which is irresistible to Mosquitos luring the insects to the powerful yet whisper quiet vacuum fan. Insects are collected and trapped into the retaining cage away from the area of usage providing the user safe pest protection and comfortable living quarters. The DynaTrap is odor-free and safe for use in the home, around children and in pet areas. It's ideal for backyards, patio areas, gardens, swimming pools - practically anywhere a biting insect problem exists. Lightweight and easy to install, it plugs into any standard outlet. And with no expensive attractant refills or propane necessary, the DynaTrap operates economically. All-weather DynaTrap uses patented three-way insect control to provide up to 1/2 acre coverage of relief from mosquitoes and other flying insects - without propane, repellants or toxins. First, two UV bulbs and CO2 lure insects to the trap. Then, a quiet fan draws them into the retaining cage where they perish naturally - no pesticides! Significantly reduces mosquitoes, biting flies, Asian beetles, wasps and other irritating insects from your indoor or outdoor living area.